Sophomore midfielder Koby Osei-Wusu controls the ball in the Colonials' game versus UMBC earlier this season. Osei-Wusu has five assists on the season. Koby Osei-Wusu, a sophomore midfielder on the newly crowned A-10 regular-season champion men’s soccer team, made a name for himself as a middle and high schooler because he played for “almost every team” in the D.C. area, including at powerhouse high school DeMatha Catholic and for D.C. United’s U-15 team. But while he was playing for his academy team in Maryland, Bethesda Olney, a scout noticed Osei-Wusu and encouraged him to play for a team far, far away. Though Osei-Wusu was born in the U.S. and grew up in Maryland, both of his parents were born in Ghana. His mother came to the United States at the age of 13, and his father came at the age of 19 on a soccer scholarship to Bloomsburg University in Pennsylvania. This family soccer tradition gave Osei-Wusu an early introduction to the game and helped his quick rise to some of his area’s top teams. On Thursday, Osei-Wusu and the Colonials will begin the Atlantic 10 tournament as the top seed. Osei-Wusu has had a strong sophomore campaign, and has been calm under increased pressure. He has started 14 games for GW and has collected five assists. D.C. United’s youth development program, coupled with Osei-Wusu’s participation in many of the area’s other top soccer academies, provided an ideal springboard for his high school career at DeMatha Catholic in Hyattsville, Md. DeMatha is known nationally as an athletic powerhouse, having produced NBA players Jerian Grant and Victor Oladipo and NFL players Brian Westbrook and Cameron Wake, among many others. Osei-Wusu’s DeMatha career benefited from a timely regulation change that allowed him to be an active participant on both his academy and high school teams. 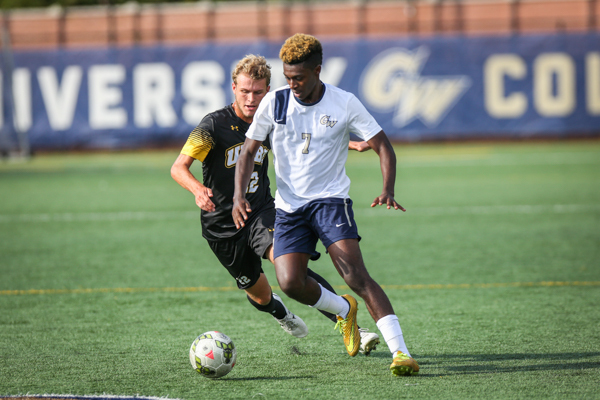 Osei-Wusu said that being able to play alongside other Division I prospects as well as future national team participants pushed him and helped him be ready for the level of competition at GW. “It was really awesome because my best friends at school were playing soccer with me and pushing me to get better, almost like a preview of college,” Osei-Wusu said. 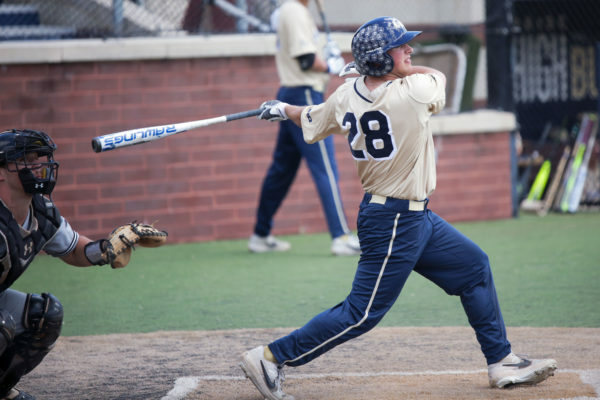 Jones began recruiting Osei-Wusu during October of his senior year of high school in 2013. The appeal of the Colonials’ program was boosted by advice Osei-Wusu received from his high school soccer coach, a GW alumnus. Following his strong freshman season, in which he saw action in 14 games for the Colonials and started four, Osei-Wusu traveled to Ghana to give the U-20 team a shot, staying there from the last week of December until January 19. Even after having stiff competition at DeMatha and a season of college soccer, Osei-Wusu immediately noticed a difference between the commitment level of the Ghanaian players and that of players stateside. The team constantly rotated players in and out of the starting lineup, so competition among team members was also fierce. Osei-Wusu said that, of about 30 players in total, 18 players were taken to each game and coaches were quick to make changes if someone was performing well. Osei-Wusu loved the environment and his teammates’ passion, and hopes to return to play with the Ghanaian team again. 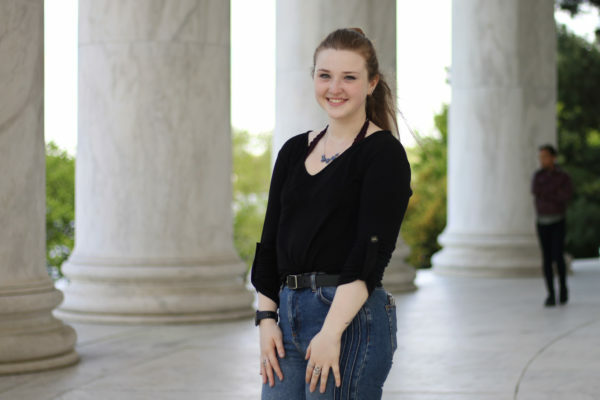 “Everyone works so hard, so it was an awesome experience. I’d like to continue with the program, if possible. I’m having a pretty good season, so we’ll see if more opportunities come about either over winter break or next summer,” Osei-Wusu said. Osei-Wusu said that right now he’s focused on helping the Colonials win, which he’s doing with his assist numbers. By the end of his college career he would like to make the A-10 first team and be named the conference’s Midfielder of the Year, but his ultimate goal would be achieved after Osei-Wusu’s GW career comes to a close.